To Give the Best Feedback, Two Words for you! The first one is “Shut” and the second one is "up!" 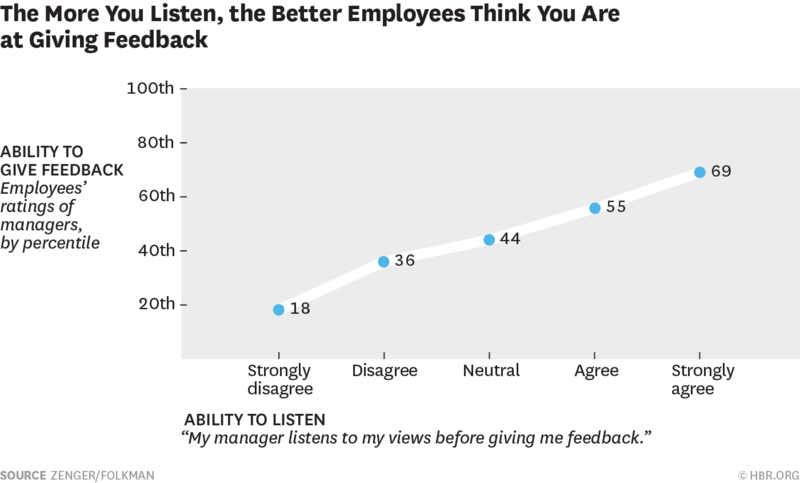 Those who listen well receive the highest feedback ratings. “What? I thought feedback was my turn to talk–you know, to tell someone what I think.” Unfortunately, that’s what I used to do. People would ask for feedback, but my brain would hear, “Please give me your opinion.” So I would start talking. It was a mistake. I’ve learned that if you don’t listen long and hard at first—the person who is speaking will think you are lousy at giving feedback (and I’ve got the proof). So to give the best feedback, in the beginning, I need to Shut… up! The study referenced in the graph above was done with employees, but it works with friends and family as well. Rating and receiving your feedback is directly related to how much the person perceives you care. You must remember: caring leaders take the time to listen! After listening well, ask a few open-ended questions for clarity and to gain additional information. I promise you that the quality of your feedback will skyrocket! BOTTOM LINE. There are only two things that you must do when it comes to feedback: 1) Choose to Care, and 2) Prove your care by the way you listen. You can practice this new behavior right now. In your very next conversation, listen longer and better than you normally do. Then (and only then), give feedback. You’ll be more loved and more listened to. And you’ll be a better leader at this time next week.